Well, this entry is devoted to my husband Rick, who bravely threw himself out of a plane last Saturday despite a big, big fear of heights. That's right, the guy who goes rock-climbing out in BFE is actually really afraid of heights. Sure he'll tie himself up to a harness and climb up 200 feet, but free-falling at 120 mph from 10,000 feet is a different story. This has been a goal of his for awhile, something that has been on his "Do before dying" list. So last Christmas, Mom, Tracy, Grandma, and I went in together for a gift certificate for a tandem jump at Oklahoma Skydiving Center. With a gift certificate, there is no backing out due to the "use it or lose it" aspect, making my evil plan complete. Mwaahahaha!!! Rick and I kept Adain this weekend while Andrea and Jason avoid Wilma on their cruise in the gulf, so we woke him up early and ate a big breakfast at Beverly’s here in the city (really good breakfast, if you’ve never been there). I suggested just eating at home, but I think Rick was worried that Saturday’s breakfast just might be the last meal of his life. When the time came, we headed out for Cushing with Adain and my mom. We started out discussing the weather, among other topics, because it was very cloudy. Rick and I contemplated how high those clouds were and whether they were of the rain variety, and consequently, whether the jump would be cancelled. As we got closer and closer to Cushing, Rick got quieter and quieter. I knew he was scared and tried to joke with him, but to no avail. We had brought some Southern Comfort for us, and I suggested a little swig before going inside, but then Mom said, “What if they can smell alcohol on your breath and won’t let you jump?” So we saved that for later. 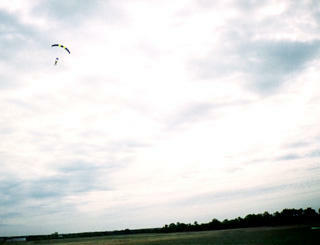 The skydiving center is a small hanger at the small airport in Cushing. Within minutes of arriving, we were joined by Justin and our friends Allyson and Jon from Oklahoma City. We arrived on time for his noon appointment, but the jumps were running late because of the cloud coverage earlier in the day. Rick spent the next two hours learning what his role in a tandem jump would be (which is primarily falling at 120 mph until the shute opens), getting outfitted in his spacesuit, and lounging around with the rest of us. There were big, old, comfy couches to sit on and a sweet black lab named Hunter that Adain was particularly fond of. A girl that worked there told us that Adain could play around on anything in the hanger, because nothing is breakable. 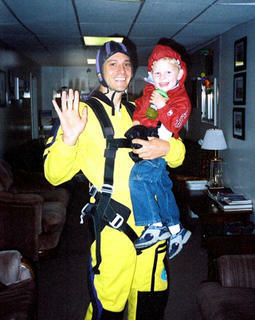 So he had a good time swinging from harnesses and jumping out of a “little” plane. Rick watched a couple jumps that were scheduled ahead of him and told me later that it made him feel better about it, since everyone seemed to really enjoy it and no one was screaming uncontrollably or crying when they got down. Allyson, who has gone on over 80 jumps herself and spent a short time working at the Okahoma Skydiving Center packing parachutes to help pay for her habit (oops! 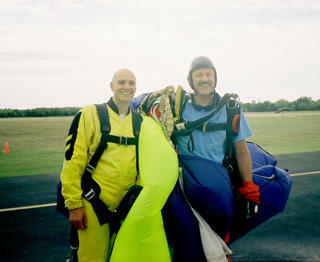 I mean hobby), also helped to prepare Rick for the big jump. So when the time came, Rick and his tandem guy Bobby, loaded up with another first-timer and his tandem guy in a tiny, tiny, tiny, tiny plane. 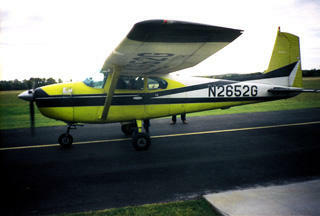 We weren’t allowed to go up and inspect the plane, but Rick said it was completely empty, no seats or anything, and all four of them were crammed up so tight that there was no room to move. After a couple minutes, they took off, and it took what seemed like forever until the jump. After the plane finally reached 10,000 feet, we saw a tiny dot left behind in the air as the plane continued forward. That was the first diver. About thirty seconds later, there was a second dot that was Rick and Bobby. I don’t know how long they free-fell, but it seemed like a long time before that parachute appeared. 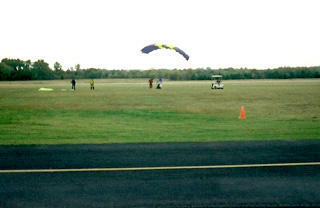 Then it was a slow drift down to the landing area directly in front of the hanger, where they landed gracefully. At least in my opinion it was graceful, since I had visions of tumbling bodies and broken ankles. After the jump, Rick was all grins and even said that he would like to go up again sometime (I just hope it wasn’t Bobby that caused all that grinning)! Allyson and Jon headed back to the city and the rest of us had a tasty lunch at the Mazzio’s in Cushing. Rick and Mom celebrated with shots on the ride home. Thank you, Justin, for video-taping for us. You did a great job. 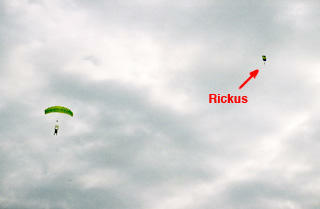 And thanks to everybody who came and supported Rickus. Amanda, we missed you and hope you are feeling better! I'm glad the jump went well. I reeeeeally wanted to be there. Damn my immune system! Anyway, just so's you know: You RAWK Rickus!